Aristophanes, one of the world’s greatest comic dramatists, has been admired since antiquity for his iridescent wit and beguiling fantasy, exuberant language, and brilliant satire of the social, intellectual, and political life of Athens at its height. This is the fourth and final volume in the new Loeb Classical Library edition of his plays. 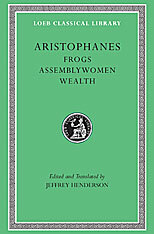 Frogs was produced in 405 BCE, shortly after the deaths of Sophocles and Euripides. Dionysus, the patron god of theater, journeys to the underworld to retrieve Euripides. There he is recruited to judge a contest between the traditional Aeschylus and the modern Euripides, a contest that yields both sparkling comedy and insight on ancient literary taste. In Assemblywomen, Athenian women plot to save Athens from male misgovernance. They transfer power to themselves and institute a new social order in which all inequalities based on wealth, age, and beauty are eliminated—with raucously comical results. 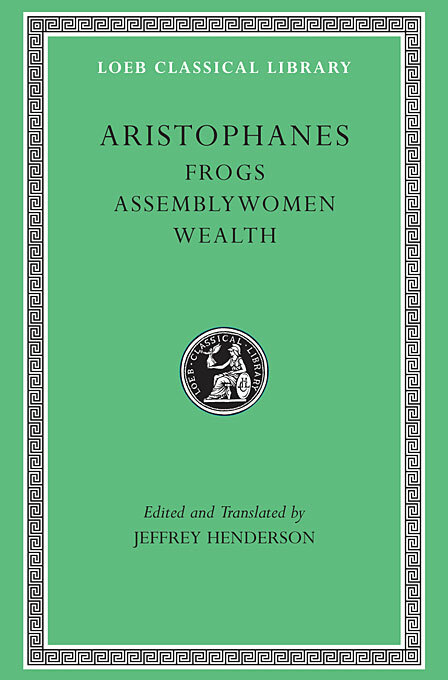 The gentle humor and straightforward morality of Wealth made it the most popular of Aristophanes’s plays from classical times to the Renaissance. Here the god Wealth is cured of his blindness; his newfound ability to distinguish good people from bad brings playfully portrayed social consequences.